The scientific rebuttal to Henrik Svensmark and Eigil Friis‐Christensen's work regarding solar as the cause for modern global warming. Peter Laut found errors in their paper and published a paper addressing the corrections. When the errors are removed the conclusions and assumptions of Henrik Svensmark and Eigil Friis‐Christensen simply do not stand. Solar can not account for modern global warming. The Laschamp Event (aka. The Laschamp Anomaly) illustrates in the paleo record that GCR's show no significant correlation between GCR's and temperature. The event shows up in many paleo records so confidence is reasonably high. But Svensmark doesn't think the evidence against 'his theory' is a big problem (as indicated in 'his' book 'Chilling Stars'). The best way for him to prove it's not a problem would be for 'him' to share 'his code and method' with the scientific community. Until then, it seems it's his word against the well known shared evidence in the world of science. So, the paleo records on GCR's and temperature do not correlate. Modern records on GCR's and temperature do not correlate. But Svensmark says they do? Even though they don't? The GCR argument seems to have degraded to an elementary school playground argument where an obstinate child says "is to"; and the school says "is not" and here's why...; and the child says "is to" and the teacher says show us your work; and the child says "no". It's not that Svensmark did not do some work, or that some of the work by itself was unimportant. The problem with Svensmark, is that his 'claims' were larger than the work could support. Svensmark claims: "Our team at the Danish National Space Center has discovered that the relatively few cosmic rays that reach sea-level play a big part in the everyday weather. They help to make low-level clouds, which largely regulate the Earth’s surface temperature." "The recent discovery by our team in Copenhagen of the chemical mechanism of cosmic-ray action on cloud formation thus brings to a climax a scientific quest that has lasted two centuries." It is precisely these claims that caused the scientific community concern. The rebuttals to Svensmarks cosmic ray theories and hypothesis generally included lack of confirmation and unsupported claims. Svensmark continues to claim relevance out of context of the lack of trend. When questioned about it he tends to remain vague. Svensmark and colleagues, not wanting to wait for the credible quantitative results to come in, instead short circuited all of that tedious follow-up work, scaling up to realistic conditions, theoretical and modeling studies demonstrating that their effect was indeed viable, and simply declared in their press materials that the team had 'discovered that cosmic rays play a big part in the everyday weather' and 'brings to a climax a scientific quest that has lasted two centuries'. Nobel prizes all round then. Alas! if only it were that simple…. Svensmark's paper itself is indeed of some interest. Aerosol processes are among the most uncertain, and most studied, aspects of climate and these experiments (they bombarded a clean mixture of water, SO2, O3 and air with high energy UV and saw small H2SO4 droplets form) might be useful in adding to that field. One could quibble with the use of the high-energy UV (which never penetrates to the lower troposphere), and the high concentrations of SO2 and O3, but by far the biggest problems lie in the study's relevance to the real world atmospheric conditions. First, the particles observed in these experiments are orders of magnitude too small to be Cloud Condensation Nuclei (CCN). In the press release, this is why they talk about the 'building blocks' of CCN, however, aggrandisation of these small particles is in no sense guaranteed (Missing step #1). Secondly, the focus is on low clouds over the ocean. However, over the ocean, there are huge numbers of condensation nuclei related to sea salt particles. Thus to show that the cosmic ray mechanism is important, you need to show that it increases CCN even in the presence of lots of other CCN (Missing step #2). Next, even if more CCN were made, you would need to show that this actually changed cloud cover (or optical thickness etc.) (Missing step #3). And given that change in cloud properties, you would need to show that it had a significant effect on radiative forcing - which despite their hand waving, is not at all well quantified (even the sign!) (Missing step #4). 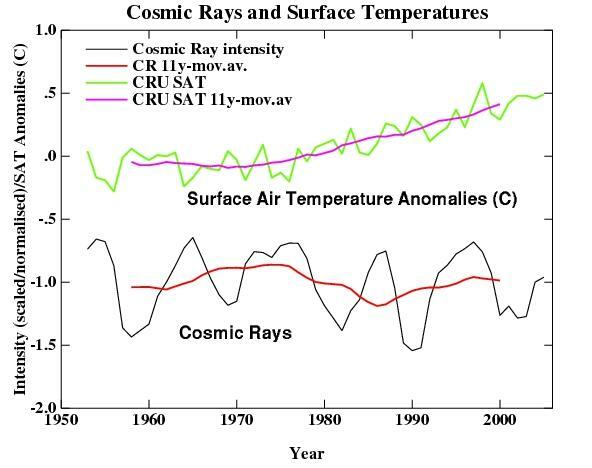 Finally, to show that cosmic rays were actually responsible for some part of the recent warming you would need to show that there was actually a decreasing trend in cosmic rays over recent decades - which is tricky, because there hasn't been (see the figure) (Missing step #5). All of this will require significant work and there are certainly no guarantees that all the steps can be verified (which they have been for the greenhouse gas hypothesis) - especially the last! However, they would seem essential to justifying the claims in the press releases. "In a new GRL paper, Svensmark et al., claim that liquid water content in low clouds is reduced after Forbush decreases (FD), and for the most influential FD events, the liquid water content in the oceanic atmosphere can diminish by as much as 7%." "The hypothesis is this: a rapid reduction in GCR, due to FD, results in reduced ionization of the atmosphere, and hence less cloud drops and liquid water in low clouds. Their analysis of various remote sensing products suggest that the opacity (measured in terms of the Angstrom exponent) due to aerosols reaches a minimum ~5 days after FD, and that there is a minimum in the cloud liquid water content (CWC) minimum occurring ~7 days later than the FD. They also observe that the CWC minimum takes place ~4 days after the fine aerosol minimum (the numbers here don’t seem to add up)." "If we look at the big picture, one immediate question is why it should take days before the alleged minimum in CWC to be visible? The lifetime of clouds is usually thought to be of the order of hours, and it is likely that most of the CWC has precipitated out or re-evaporated within a day after the cloud has formed." Rasmus has pointed out that there are more than just a few holes in the work of Svensmark et al. If the lifetime of clouds is in the order of hours, what is or could be the effect on clouds, days later? This is a very good question. "The paper does not discuss the lack of trend in the GCR of moderate energy levels or which role GCR plays for climate change. They have done that before (see previous posts here, here, and here), and it’s wise to leave out statements which do not have scientific support. But it seems they look for ways to back up their older claim, and news report and the press release on his paper make the outrageous claim that GCR have been demonstrated to play an important role in recent global warming." Simply put, galactic cosmic rays (GCR's - paleo and modern measurements) do not correlate with the rise in global mean temperature. The now well established facts are in the connection between greenhouse gases, attribution and radiative forcing. The amount of greenhouse gases in the atmosphere account well for the current climate forcing. It is interesting to note the Svensmark Video is produced in such a way as to indicate that there is some sort of conspiracy by the climate science community in debunking his work. The reality is, he did not do work that was able to support his conclusions.